Hiking photography seems to require a bit more skill than point-and-shoot. Never have been, never will be. But I certainly do love enjoying photos of my hikes! My husband carries a camera and uses it liberally on every hike. He's documented all of our hiking adventures. Check out his work on the HFH Instagram page. He was the one who thought of taking along "helmet cam" on our hikes. Helmet cam is an amazingly lightweight video camera. The ability to zoom in on wildlife is priceless! An idiot (me) can get great quality footage, with just a tiny amount of know-how. Point and shoot - hiking photography couldn't be simpler! That's me in the photo above, using helmet cam. Almost looks like I know what I'm doing, doesn't it?! 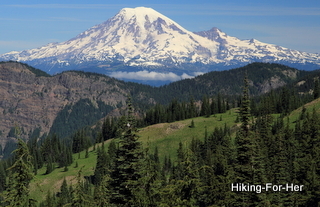 You can see what I'm seeing in this series of Mount Rainier day hike videos. Now you know my secret: I don't hold myself out to be an expert on taking outdoor pictures. Instead, I'll point you toward some credible resources on outdoor photography to help you capture your hiking memories without too much effort. And if I can do this, you can, too! Here's a website to get you started on thinking about outdoor photography. For basic how-to's appropriate for beginner hikers, this site shares tips for mountain based photography. Now here's a photographer who works close to home: Cascade Mountains in Washington State. I heard him speak once, and he described building his own plane and how hard he works to get these amazing shots. Inspiring, no? Here's a website with all sorts of digital photography tips.... start with the nature photo tips and see what else might be of use to you. If you like reading how-to books, give this one a look: The Backpacker's Photography Handbook by Charles Campbell. No sense carrying expensive camera gear without a suitable backpack to shield it from the elements, right? Camera backpacks can be as lean and mean, or overbuilt, as you desire. Read up on a few great choices here. Work your way through that resource list to find one that clicks (ahem! ), then put it to good use with your camera. I'll add to this list as I stumble across good resources for you! You might be able to create an album of the beauty of alpine flowers by simply experimenting with your current equipment. 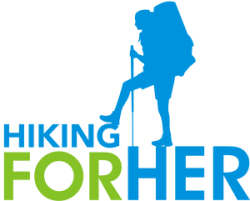 If you're an outdoor photography website owner, or would like to recommend a photo site for hikers, please contact me.